Prototype: Six (6) different design Swiss Federal Railways (SBB) freight cars. Two (2) type K3 boxcars with a brakeman's cab. One (1) low side car with a brakeman's cab, one (1) beer refrigerator car. One (1) type J3 boxcar with a brakeman's cab. One (1) tank car with a brakeman's cab. All of the cars look as they did around 1919. 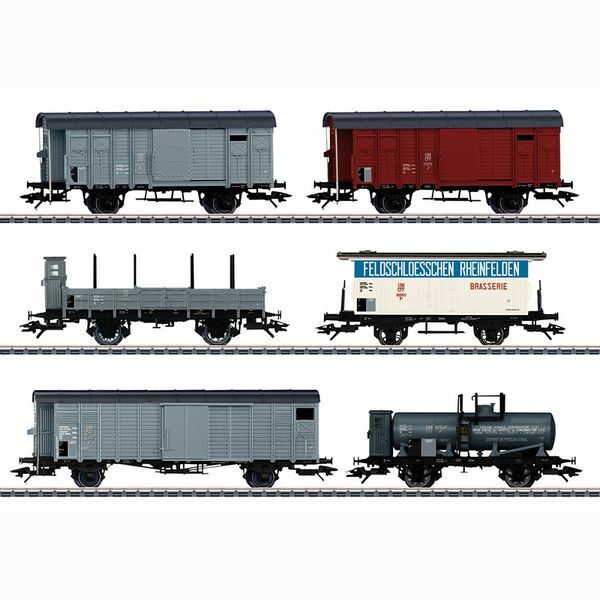 Model: The type K3 and J3 boxcars have sliding doors that can be opened. Stakes are included for mounting on the low side car. The beer refrigerator car has brakeman's platforms at both ends. All of the cars are individually packaged. There is also a master package. Total length over the buffers 69.5 cm / 27-3/8". DC wheelset E700580, E32360009, E700630, E32301211. The electric freight locomotive to go with this car set is the class Fc 2x3/4 "Köfferli" / "Little Suitcases" and it can be found under item number 39520 in the Märklin H0 assortment.